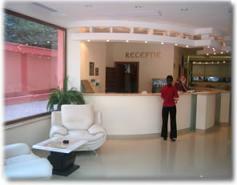 Euro Hotels in Bucharest is located in the vicinity of the Triumph Arch - 10 minutes by car from the city centre. The hotel provides 58 rooms (single, double, and studios) with all facilities: international phone,internet, cable T.V., air conditioned, mini bar. Other facilities : in house parking, bar restaurant, laundry, room service.